Each Push Back Rack cart supports one pallet and each pallet is pushed to the position behind when a new pallet is loaded. The Push Back Rack cart system is gravity driven system and engineered specifically for the number of pallets that are to be stored. The UNARCO Push Back rack system can be from 2-5 pallets deep; the carts are secured and glide easily along sturdy rails. Heavy-duty system helps reduce maintenance problems. The thin profile of the carts allows maximum product storage and available vertical space between beams. Each push back rack cart has four stainless steel skate wheels that rest on the rail; this configuration keeps the entire system working in unison. The steel carts provide ample support and may be specifically engineered to accommodate applications with damaged or unstable pallets. The low profile vertical clearance of UNARCO Push Back Rack carts keep pallet storage as dense as possible. 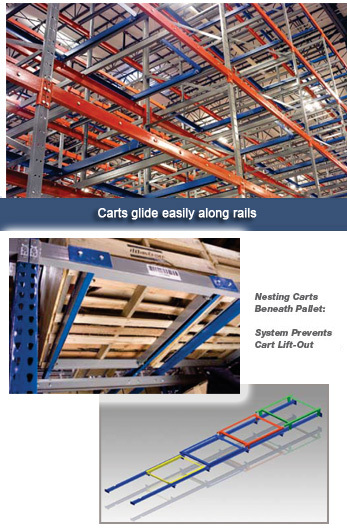 Carts are engineered for pallet size and pallet style to maintain gravity flow and allow for proper placement within the push back racking system. Special cart systems can be developed for pallets in poor condition or odd-sized pallets. Push back rack carts can be color coded so drivers can tell how many pallets are behind the pallet located in the picking position. Each cart will be powder coated a different color so that each pallet position will be easily identifiable to the forklift drivers. UNARCO’s Engineering department can easily configure a push back rack system to meet your capacity and configuration needs. Throughout the years UNARCO has designed some of the most sophisticated push back rack systems in America with pallet flow to pick modules and conveyor for smaller package case breakdown. Push back rack is a perfect answer to freezer applications and carts and pallet rack can be galvanized for rust resistance. For more photos on Push Back Rack carts view UNARCO Push Back Photo Gallery.